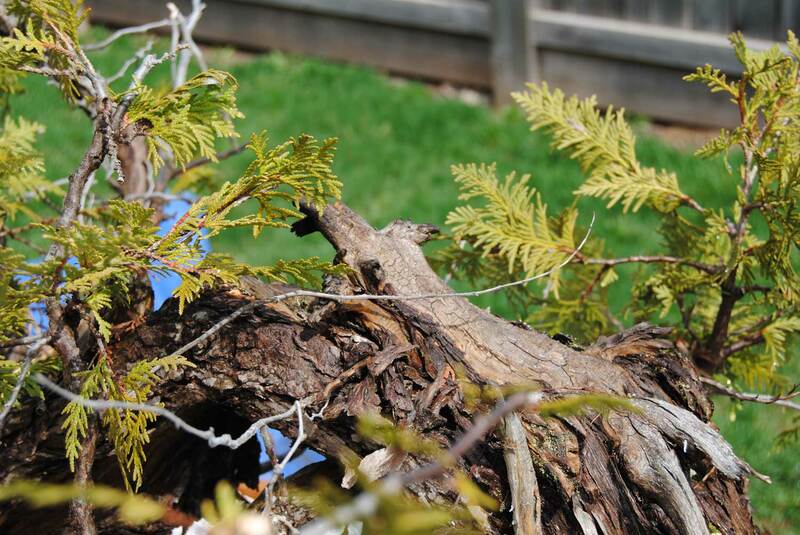 This large Thuja occidentalis was captured in April of this year. All of the pictures except the last one were taken in April soon after collection, when the tree was still in it’s dull winter colour. The trunk is huge with some dramatic movement. 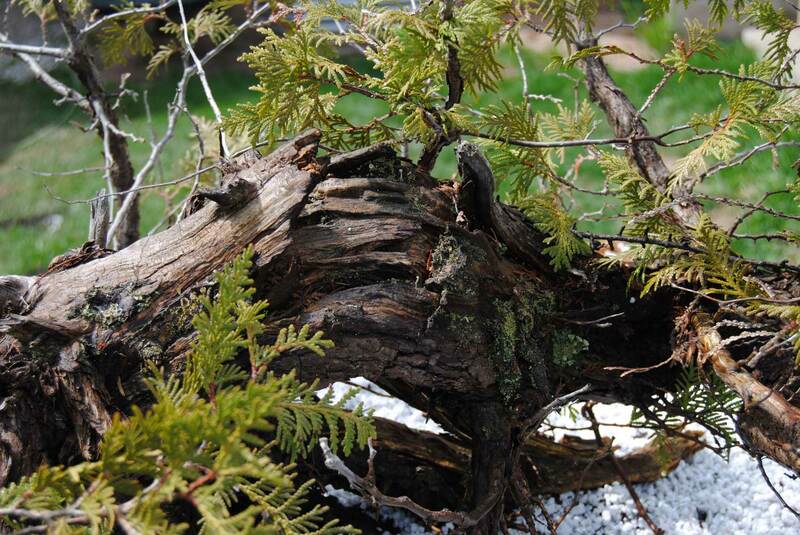 The deadwood also tells some fascinating stories, particularly the massive break in the 8″ diameter middle section. One has to wonder how damage like this could be done without completely uprooting the tree. This tree certainly doesn’t present any easy design solutions, so it will be a challenge. Currently these are the best pictures I have of the tree as it is tucked away in the rehab area. Hard tree to photograph as the base is covered by some branches. 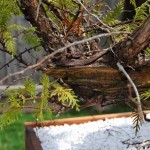 I’ve been planting all of my larger collected trees in pure screened perlite for the last couple of years. 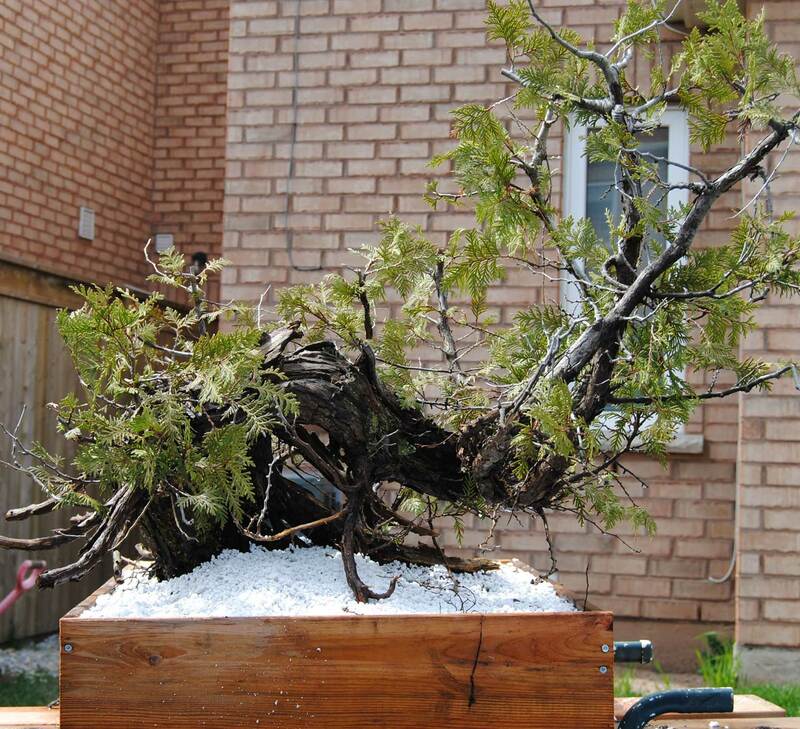 Before root washing and potting up, giving a glimpse into the base of the tree. 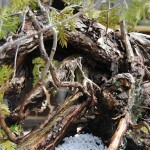 This is a good example of the impenetrable root mass that Thujas are often collected with. Very little of it is actually live root. 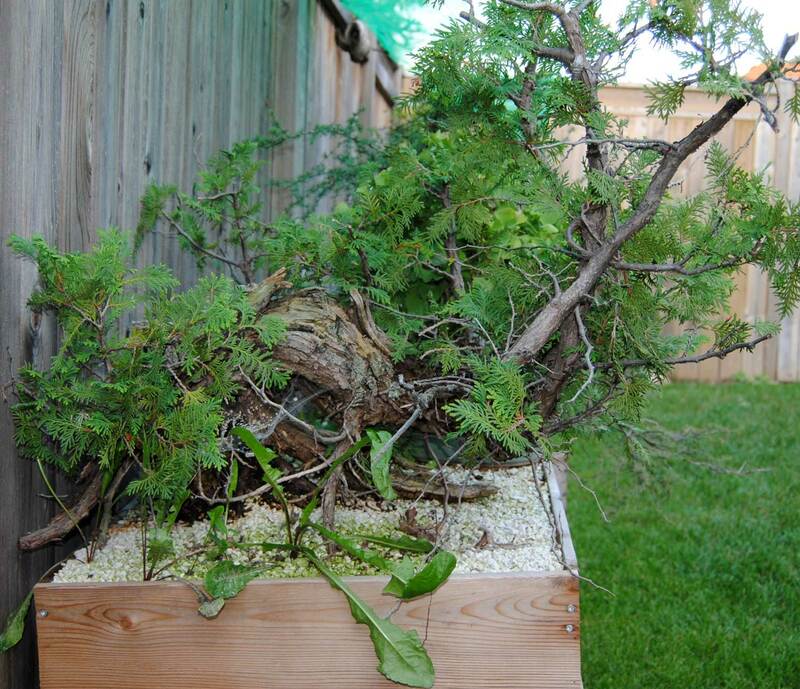 Hosing out as much muck as possible greatly simplifies watering the containerized tree. A more recent picture of the tree. It has been under shade cloth the entire year. This entry was posted on September 10, 2013. 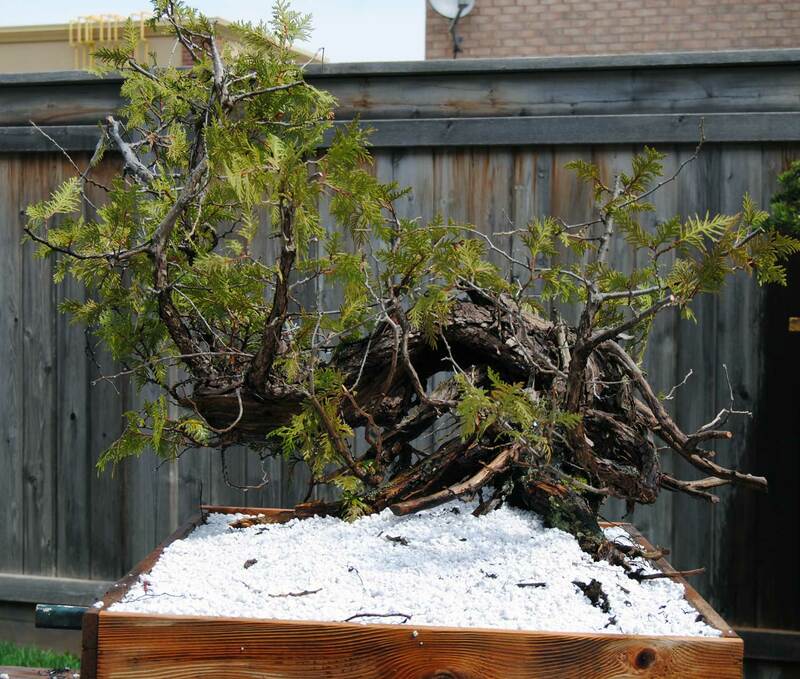 It was filed under Bonsai, Canada, Collecting, Thuja occidentalis, Toronto, Yamadori and was tagged with Arborvitae, Bonsai, Collected, eastern white cedar, Thuja, yamadori. Nice WC. Is this in 100% pumice or perlite? Yup thatd be straight perlite. Hello from across the Lake. Enjoy reading your posts. Interesting that you hosed off the soil from a recently wild-collected tree. I would think that would cause unwanted stress to the tree. You’ve obviously done this before with success? 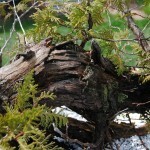 When I collect thujas here, I try to disturb that root mass as little as possible. I too use a high concentration of perlite. Would prefer pumice, but that gets expensive. 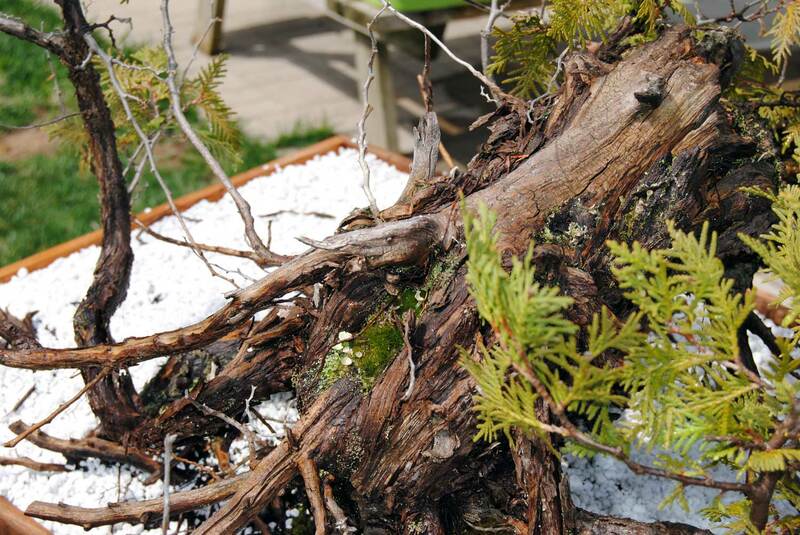 The porosity and heat retentive qualities of perlite or pumice are great for those newly collected trees. As well, your wooden boxes look like something I would have built! Thanks for sharing. Thanks for the comment. 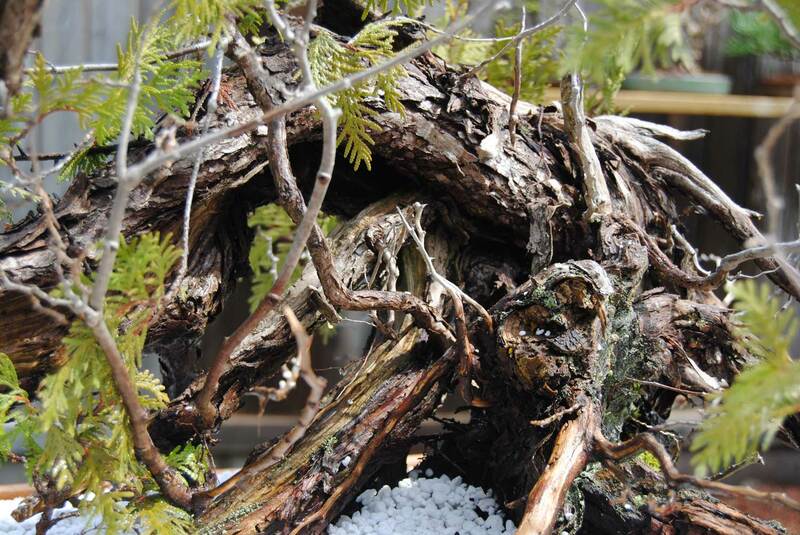 I don’t hose of all of my newly collected Thuja and Larix – just the ones with super dense mucky rootballs. Where I collect, this usually means most of them. Nick Lenz also recommends this in his book when the situation calls for it. If you look at the gigantic dense rootball of this one, you can imagine that there is no way new roots would be able to grow inside of it. Furthermore, probably 90% of the “rootball” isn’t living root at all. It makes controlling watering very difficult when you have this muckball in the middle and new bonsai soil surrounding it. In the wild they do just fine become they come from extremely dry environments. It might seem intuitive that it is unnecessary stress, but consider the alternative – the roots would be deprived of oxygen and susceptible to fungal attacks… certainly a stressful situation. Keep in mind I don’t completely bareroot them after collection – just hose it off enough so I can work new soil into the rootball. 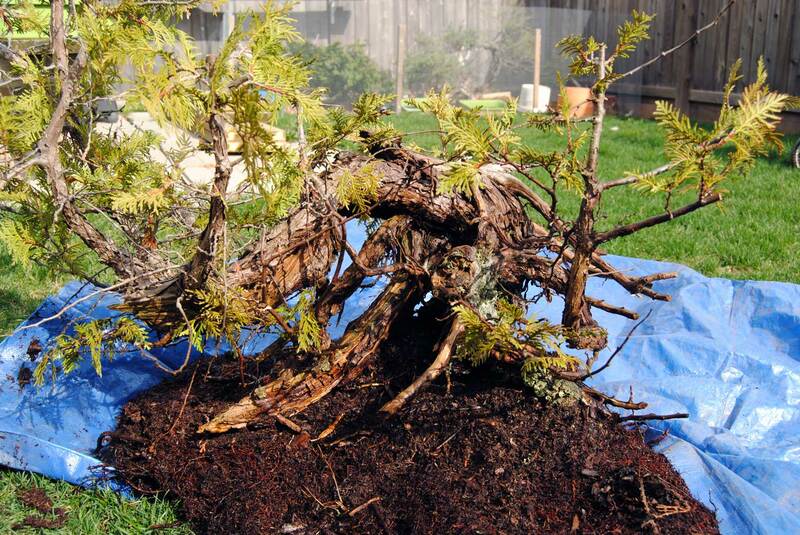 I’ve had very good success with this approach, but have killed thuja which I left the mucky rootball undisturbed – I attribute their death to root rot in the muck. 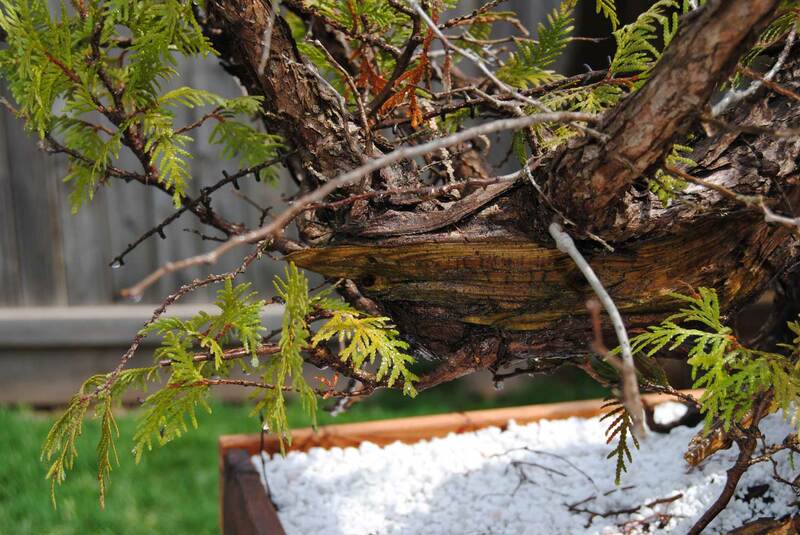 As you probably know, the root systems of Thuja and Larix are quite unusual for conifers, being much much more robust than pine or juniper. So they can be treated a bit differently. Thanks so much for the response! I was wondering what your collecting conditions are. 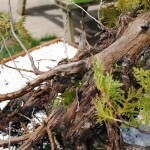 Most of my larix are out of swamps and when I think about I do remove the muck and get perlite or pumice down in close to the main root system. Thujas have been found in both dry and wet conditions, but they seem to have vigorous root balls that are able to be removed more completely. Those I’m more reluctant to disturb. 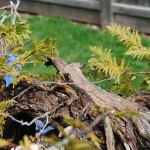 Surprisingly, the scots and jack pines have had strong rebound ability following collection. Definitely have had better luck when providing a shaded area for establishment. Don’t have any pics right now, but will take a few this weekend. The areas you go must be similar. I’ve seen your posts on potentilla. Lake Huron is wonderful and surrounded by some very nice limestone. I suspect our collecting areas are similar.